You are here: Home / 10 Years Ago: Did “Monster Quest” Prove Bigfoot? Unlike some, I am not surprised that the History Channel and the producers of Monster Quest’s “Sasquatch Attack” did not leak the fact that Sasquatch DNA may have been collected. I do not feel upset with Jeff Meldrum because he didn’t rush in front of a microphone soon after the documentary filming to announce the rock-throwing and that a Sasquatch had stepped on a “nail trap.” Ouch! Really, you know, we have been here before. Meldrum and the Hajicek crew say they recovered hair, blood, and tissue samples of a Sasquatch. The skeptical DNA specialist found there was nothing there to study. Another scientist claimed to have removed the galvanized nails’ contamination and found the hair was “almost human.” Don’t you remember the different reactions to the Skookum cast hair samples? The Pangboche Yeti hand tissue samples came back “near human, but not human,” in other words, “almost human” in 1991. There are three layers of keratin in hair: the medulla, the cortex and the cuticle. Missing in this new Monster Quest sample is the medulla (the spongy core), which is present in human hair. But what does this mean? The program never fully explains the possibilities for why this occurred or was found. The Monster Quest samples collected were also tested for DNA and again that “almost human” finding came back, noting it was like a human sample, with the exception of one base pair difference with humans. The program noted this sample seemed to be from a species that was closer to humans than chimpanzees’ DNA indicated those African apes are. 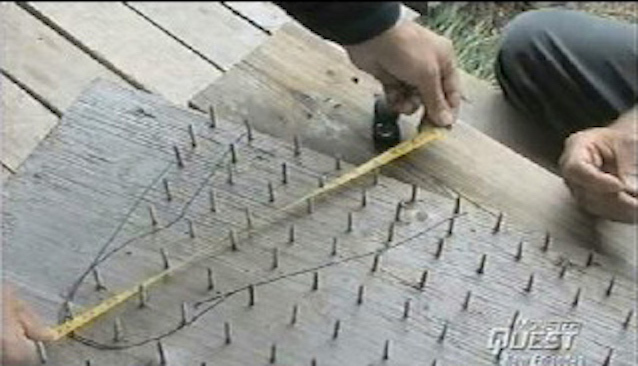 The rock-throwing incidents were the ones the producers used to get viewers’ interest excited, but the Sasquatch stepping on a nail trap was left out of the pre-screening teasers. I have no idea why that was done, other than idle speculation that the complex nature of the assumed cruelty to the Bigfoot and the DNA testing do not translate well to a trailer. Were they scared? Did they think they were dealing with poltergeist activity or a possible new species of primate? Why stay inside, indeed? For filmmaking purposes, fear, or so they could claim they saw one if a Bigfoot came to peek in a window? This primal human behavior is difficult to understand in terms of the expressed purpose of the mission there. Certainly, the program covertly hints at pondering on this: What might have happened if someone had been attacked physically by a Sasquatch? Or what would have transpired if a member of the crew had shoot or stumbled across a dead Sasquatch, during this documentary production? Meanwhile, the tabloid The New York Post is about the only media outlet that has picked up on what might have seemed to be, in another era, very nearly a major finding. I think The New York Times, the Times of London, the International Herald of Paris, and The Washington Post are all waiting for the body to declare any earth-shaking coelacanth-like discoveries, re: Sasquatch. Meanwhile, take a moment. Do ask yourself the big one, what happens when the first Bigfoot body is found? I wonder what Hajicek’s and Meldrum’s backup plans were for such an event? The History Channel may have discovered the missing link. In its new show “MonsterQuest,” an adventurous group braved the wilderness to see if “Big Foot” [sic - should be Bigfoot - LC] actually lives in Ontario, Canada. Scientists Kurt Nelson and Jeff Meldrum spent five days with a video and audio crew at a cabin in the utterly remote Snelgrove Lake, pulling DNA samples from the trap and exploring the forest. 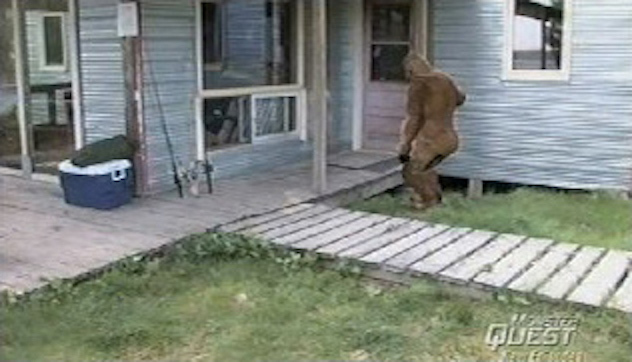 The show has caused a stir among enthusiasts because it has gotten so close to proving the Sasquatch monster may, in fact, exist. The show made “contact” with the thing on its last night of filming. The crew threw a stone back and, in a matter of minutes, a second stone was launched at them. Blood, tissue and hair discovered later on a bear trap outside the cabin was tested. The hair did not match any known North American bear or animal and tests showed an uncanny similarity to human DNA with one exception: the irregular DNA matched that of a primate. “It is a show that presents and analyzes the evidence,” said executive producer Mike Stiller. “But, ultimately, it’s up the viewers.” ~ Melissa Jane Kronefeld, New York Post. Click here: Thank you for your personal support of the medical fund.